featuring members of New Riders of the Purple Sage, Hot Tuna, Zen Tricksters, Phil Lesh and Friends. Guitar Players ////Michael Falzarano (Guitar / Vocals) After decades-long stints with Hot Tuna and the New Riders of the Purple Sage, Michael has earned nothing less than iconic status as one of the most authentic figures on the blues / jam band scene. Over the years, Michael’s evocative singing, intuitive guitar playing and songwriting skills have earned him a large and loyal following worldwide.Rob Wolfson (Lead Guitar / Vocals) Having already developed into a formidable blues rock player at the age of 12 by studying Eric Clapton and Jorma Kaukonen, Rob entered the world of Grateful Dead music in ’69 and has continued exploring ever since. Notable projects include Dead Sage, Joe Gallant’s Illuminati Orchestra and DeadCenter All Stars, which he established in the late 90’s with the Wetlands Preserve Club and is still going strong today. Keyboard Players ////Scott Guberman (Keyboards / Vocals) Scott has distinguished himself over the last several years as one of the principle keyboardists in many of Phil Lesh’s homegrown projects including Phil and Friends. Scott’s reputation as one of the genre’s best and most creative players is undisputed. He also plays regularly with many other significant musicians in the San Francisco Bay area when not touring nationally. Bass Players ///Klyph Black (Bass / Vocals) In Klyph, along with Tom and Dave (below), the Englishtown Project is fortunate to have 3/5ths of the classic lineup of Zen Tricksters, the best and longest running Grateful Dead-centric band in the Northeast. Not only is Klyph an outstanding bassist, he is also an excellent guitarist and one of the most accomplished musicians on the Jam Band scene today. Frank Canino (Bass / Vocals) Frank an outstanding bassist and composer, is one of the most accomplished musicians on the Jam Band scene today. He stays busy touring the country and has play bass for The Joe Cocker Band, The Ray Charles Band, Dead Sage and the Dead Center All Stars to name a few. Dave Diamond (Drums) Most fans of the Grateful Dead know what a great drummer Dave is, but more and more are coming to realize that Dave is a multi-talented musician to be reckoned with. In addition to his long tenure with Zen Tricksters, Dave drums for the excellent alt-rock band Assembly of Dust and his own eclectic Dave Diamond Band where he is the lead singer, guitarist and songwriter. Joe Chirco (Drums) Fans of the Grateful Dead around the country know what a great drummer Joe is. He’s been on the Jam Band scene for quite a long time. Making him one of the most sort after drummers around. 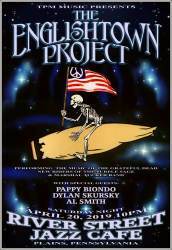 He’s played in the John Kadlecik Band, Donna Jean Godchaux Band with Jeff Mattson, Zen Tricksters and Dark Star Orchestra along with being the drummer for Half Step and now you can see him with The Englishtown Project. Alan Lerner (Drums) Highly versatile drummer Alan Lerner is an in-demand session and live drummer throughout the tri-state area. Known for both his power and feel on the kit, Alan has toured with the prolific Joe Gallant & Illuminati and the Zen Tricksters. He’s played extensively with bass legend Jerry Jemmott, as well as gigged with Mike Gordon, Levon Helm and Hubert Sumlin. Alan currently performs with the acclaimed Joni Mitchell tribute band, The Joni Project; various projects of Hot Tuna and New Riders of the Purple Sage’s Michael Falzarano including The Englishtown Project and Dead Sage. Singers /// Clare Maloney (Vocals) New York City-based vocalist, Clare Maloney, has been hailed for her " golden voice of immense range and depth," and has delighted audiences around the world with her thoughtful artistry, polished singing and wholehearted performances. Raised on Rock & Roll and trained in Classical Music and Opera, Clare's musical knowledge and her skillful ability to move between musical genres have established her as a go-to musician. 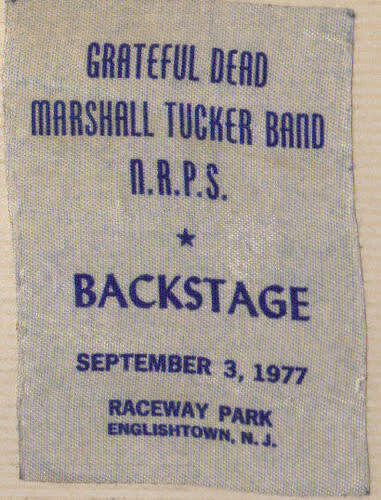 Her interpretations of the Grateful Dead are earning her a steady following on the Jam Band scene, and she sings regularly with Rainbow Full of Sound, and the Englishtown Project. Joanne Lediger (Vocals) Joanne is a long-standing member of the Jam Band Family having spent decades with the seminal band Stir Fried and her recent stint singing lead in Reverend Jefferson, a band that explores the music of The Jefferson Airplane. Joanne can be heard putting her spin on legendary Airplane tunes that defined a generation.